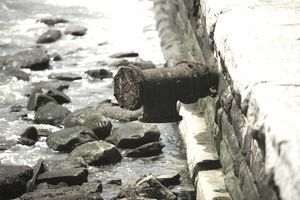 Galvanic corrosion can only occur when two electrochemically different metals are close to one another and also submerged in an electrolytic liquid (such as salt water). When this occurs, the metals and the electrolyte create a galvanic cell. The cell has the effect of corroding one metal at the expense of the other. In the case of the Alarm, the iron was corroded at the expense of the copper. Just two years after attaching the copper sheets, the iron nails that were used to hold the copper to the ship's underside were already severely corroded, causing the copper sheets to fall off. Metals and metal alloys all possess different electrode potentials. Electrode potentials are a relative measure of a metal's tendency to become active in a given electrolyte. The more active, or less noble, a metal is the more likely it is is to form an anode (positively charged electrode) in an electrolytic environment. The less active, or nobler a metal is, the more likely it is to form a cathode (negatively charged electrode) when in the same environment. The electrolyte acts as a conduit for ion migration, moving metal ions from the anode to the cathode. The anode metal, as a result, corrodes more quickly than it otherwise would, while the cathode metal corrodes more slowly and, in some cases, may not corrode at all. In the case of Alarm, the metal of greater nobility (copper) acted as a cathode, while the lesser noble iron acted as an anode. Iron ions were lost at the expense of the copper, ultimately resulting in the rapid deterioration of the nails. With our current understanding of galvanic corrosion, metal-hulled ships are now fitted with 'sacrificial anodes', which play no direct role in the ship's operation, but serve to protect the structural components of the vessel. Sacrificial anodes are often made of zinc and magnesium, metals with very low electrode potentials. As sacrificial anodes corrode and deteriorate they must be replaced. In order to understand what metal will become an anode and which will act as a cathode in electrolytic environments, we must understand the metals' nobility or electrode potential. This is generally measured with respect to the Standard Calomel Electrode (S.C.E.). A list of metals, arranged according to electrode potential (nobility) in flowing seawater can be seen in the table below. It should also be pointed out that galvanic corrosion does not only occur in water. Galvanic cells can form in any electrolyte, including moist air or soil, and chemical environments. Source: ASM Handbook, Vol. 13, Corrosion of Titanium and Titanium Alloys, p. 675.